Add a blast of color to arts and crafts activities! 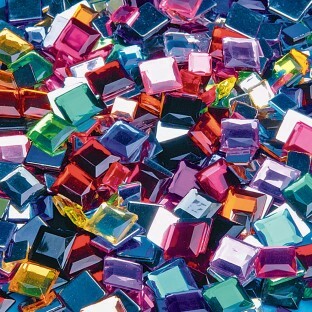 Acrylic gemstones of various shapes. Assorted sizes, 6mm and 10mm. Add a blast of color to arts and crafts activities with a colorful classroom pack of acrylic gemstones of various shapes. Assorted sizes, 6mm and 10mm. Approx. 500 pieces. Easy to apply. Instantly adds value. The colors were vibrant and attracted the attention of the kids. There seemed to be a larger number of smaller gems so it didn't look like there were 500 in the bag. I was dissappointed with the shipping cost $8.95. This will hinder any purchases I make in the future. We wanted to use these as Tic-Tac-Toe markers for a craft at VBS. There were not enough of the larger size and even those were smaller than we wanted. We ended up using them to decorate one of the other crafts. When using these with craft projects use good glue or GlueDots to avoid the jewels popping off when the glue dries. The kids love the shine but the pieces are too small for some projects.